So it's another baking post! Let's put our hands in the air and have a party! I love reading baking posts, and I love writing baking posts and here's an Autumnal bake just for you! 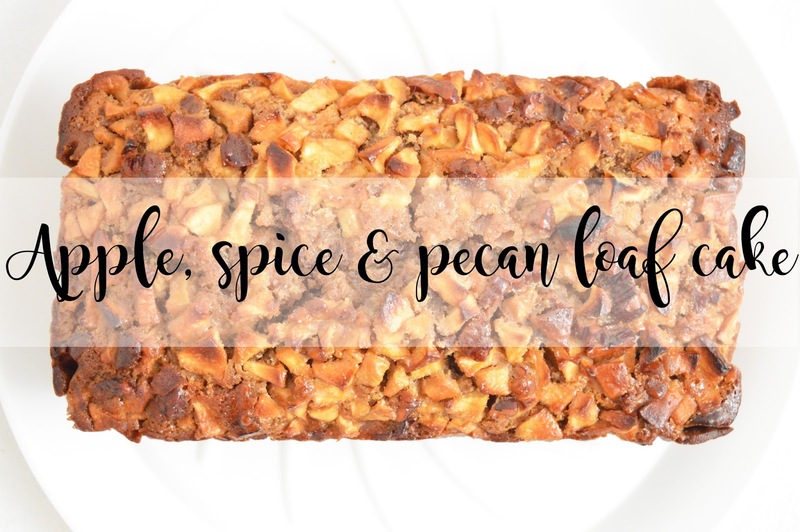 So Jess from Jems Journal asked me if I could possibly make some sort of Autumnal cake which included spices and apple, so I've accepted her request and I have made a beautiful, scrumptious Apple, Spice and Pecan Loaf Cake! I was very wary about this cake as I have never made any cake before which included apples. However, I have made an apple pie and crumble before. The day I made this, I collected a large bag of green apples which came off someone's tree in their garden. I had absolutely no idea what sort of apples these were of if they would be nice, but I still spent hours peeling them with my mum and cutting them up into small pieces for a cake. This loaf cake is soft, airy and absolutely divine! You can taste every single added ingredient to this cake which is what I love most about it! You can take one single bite, and you're given the taste of each spice, the apples and then the pecans. Everything you want in one single cake! It's very rarely you find a cake where you can taste every ingredient. Sometimes ingredients can be so strong, they wash out the rest of the beautiful ingredients which are included. However, this isn't the case with this loaf! It's easy to make too! 230g apples, peeled, cored and chopped. Preheat your oven to 180 degrees, and line a 2 pound loaf tin or two 1 pound loaf tins. Melt the butter, sugar and syrup together. Once these have melted, stir in the milk and leave to cool. In a separate bowl mix together the flour with the spices and baking powder. Make a well in the middle of the dry ingredients and pour in the cooled liquid mixture. Mix these ingredients together until combined. Fold in the eggs, pecans and apples. Pour the mixture into the loaf tin(s) and bake for 75 minutes, or until a skewer comes out clean. Leave to cool for 10 minutes and move onto a wire rack. Ooooh! This looks so yummy! I'm so hungry just thinking about it! This looks amazing!! I need to try this as love baking! I'm going to try making this because it sounds amazing! Thank you for sharing!